Professor Elvin Atombender, a scientist gone crazy, is about to launch a nuclear missile in 6 hours, and it's your task to infiltrate his base and stop his plan! 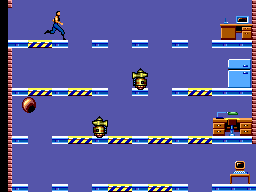 Impossible Mission has its roots back in the early home computer era, when machines like the C64, Spectrum or Amstrad were popular. The game was well known mainly thanks to its early adaptation of speech synthesis and animations. Later on it was ported on other system, such as the Master System. The game is a mix of platforming and puzzles. You start inside the first elevator shaft from which you can access different rooms. Inside these rooms you are presented with different threats and an objective. The threats are in the form of robots with several unexpected behaviours and your objective is to search for puzzle pieces or useful items inside the furnitures. It might not sound exciting, but surely it's not an easy task, because the robots behave in many different ways, they just move back and forth over a platform, they zap everything that get close to them with their laser or they stay still and run towards you as soon as you jump over it. There are many reasons as to why you should study them before you jump over platform. You don't have any weapons to help you in your journey, except for a spectacular somersault jump that useful to avoid pits and robots robots and 2 items that you find when you search the furniture: a robot disabler that freezes the robots inside the rooms for a limited time, and a lift reset that puts every lift in the room to the starting position in case you messed up. You won't find many of these, so use them wisely. You will also find 1 unique room with a strange checkerboard. When you use it will show you a musical pattern, if you sort the notes from the lower pitch to the highest it will give you a free item. 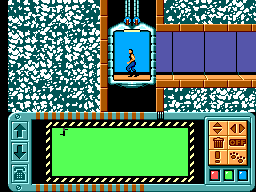 After you have searched every room in them game, explored every interconnected elevator shaft and found all the 30+ pieces, you can use your portable device inside the lobby and try to assemble the puzzle. There's always only 3 pieces that go together to form a full punch card, but still it will take some time to put everything together in the right orientation. When you are done you are ready to ruin Elvin Atombender's crazy plan! Seems difficult enough? Please mind that you have 6 hours of real time to beat the game, but every time you die the game will add 10 minutes to the timer. So if you mess up too many times inside a difficult room you will feel a lot of pressure, and it's better to play safe using a few items to help yourself. The platforming isn't bad, it requires some precision and prediction taking the robots into consideration. However I find it frustrating compared to other versions, because of the hitbox. Most of the time you can easily jump over the robots, sometimes not, especially if you are in the highermost platforms. I don't know if it's just me, but I keep dying because the jump seems more unprecise in that side of the screen. And also, you will find many fast moving robots in short platforms which means that they are impossible to avoid and require an item to freeze them. This can get frustrating in an already difficult run. I find the graphics very essential, but pleasant, it's upgraded compared to the computer versions. Everything looks colourful and detailed enough to distinguish every single element. The animation is still very good and fluid enough, but all in all the game doesn't really shine in this particular section. This is the part that made the game popular, the voice synthesis. How did the Master System perform? Well, fairly good, but nothing impressive or new at the time of release. It's pretty much the same as the computer version with quotes like "Another visitor. Stay a while. Stay forever!" and "Destroy him my robots! ", or the iconic scream when you fall down a pit. On the other side you have a whole lot of bleeps and blops from the robots and portable devices and the sound of the elevator. The only music you hear is from the title screen and it's forgettable at best. The game is not complex at all, so the controls are just easy and practical. Both buttons perform the same action, jumping or using the terminals to activate the items. Pressing up searches the furniture, pressing up and down inside the elevator...well, moves the elevator. When you use your portable device you can move around the puzzle pieces by clicking them, or you turn them around, or change colors with the onscreen controls. Very easy and straightforward, and everything responds fast enough. You have 6 hours to beat the game, but you will never play a single game for that long. In 20 minutes to 1 hour you will be either dead or at the end of the game. It's challenging enough to keep you hooked if you are into the genre. The best part of the game is that the first time you turn it on the map has a fixed layout, so you are free to write it down and learn it to do better every time, but every time you reset the console it gets randomized! This means that it has the potential to be infinite if you love it, or incredibly repetitive if you hate it. However this doesn't deny the fact that you can play it as many times as you want and always find something new. 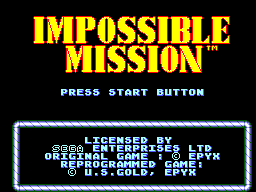 Impossible Mission is an old classic game that you will either love or hate, it all depends if you like this type of challenge. If you love it it's a great game that keeps renewing itself at the simple push of the reset button, if you hate it you will hardly touch it again. Quality-wise at this day it's still a great mix of ability and thinking and that will keep you busy for a while.